Enabled - Lets you phase out old categories. Notice how Tickets doesn't show up in the list because it is not enabled. Show Buyers - You may decide that some 'cash and carry' type items don't really need a connection back to the donor on each buyer's statement. If you had an 'Gift Basket' category, you might want to check this. There is no way to set this at the item level, just the category. Most Items physical - This is just the default setting for new items of this category. For example, 'Services' would be unchecked, 'Gift Baskets' would be checked. For some categories, it's a tough call, but remember each item can override this default setting. Note that especially for self-entered items, don't expect most users to notice/understand this setting - you'll likely have to proofread it carefully. 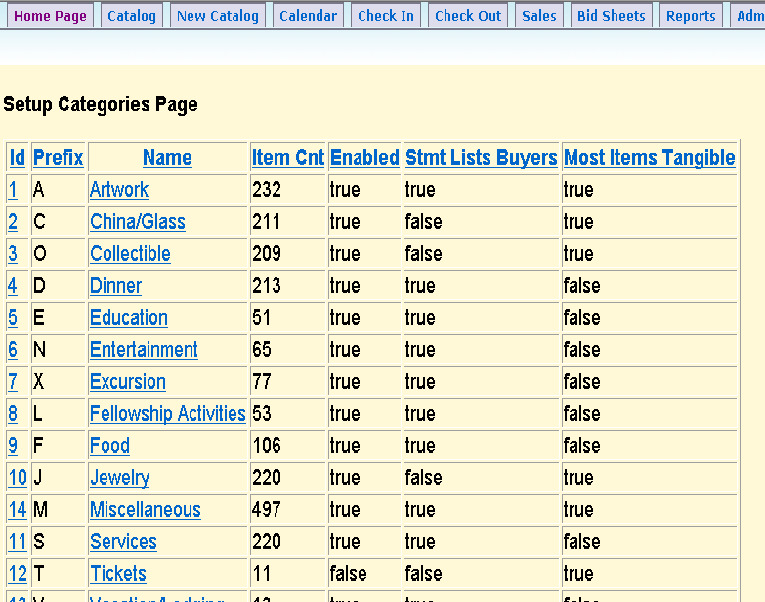 You can enter a category-specific message to print on the bid sheets just above the bidding area. This was designed to replace the hard-to-follow concept of minimum bid increment rules with a simple message - remember, your message has to be very brief if you expect anyone to read it - something like "Bids should go up $5 or more on each line"
If you mention bid increments in your message, you can use %bidIncrement% to refer to the value according to your bid increment rule formula (See [Internal Codes] for more info). There is both a normal message, and a separate message for fixed price items. Bids must increase by at least %bidIncrement%. Winning bids are counted upwards from the highest bid. When the silent auction is over, bidding should stop. Let's keep the competition friendly! Bids for multiple qty should be written on separate lines. When the sheet is full, the bidding is over for this item! (We have the same language for every category, but some people just have fixed suggested increments per category - if you do that, and you also enable online bidding, you may want to add a SUGGEST_NEXT_BID false setting.